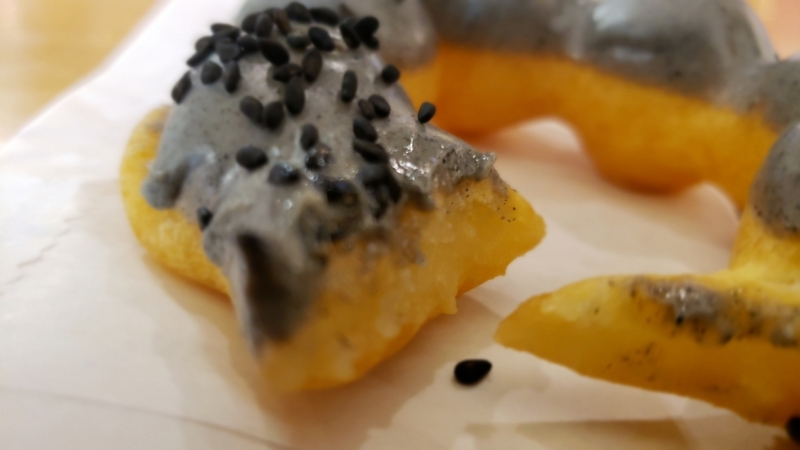 Black sesame has a strange allure for me. Perhaps because it seems so foreign of a concept of flavor. 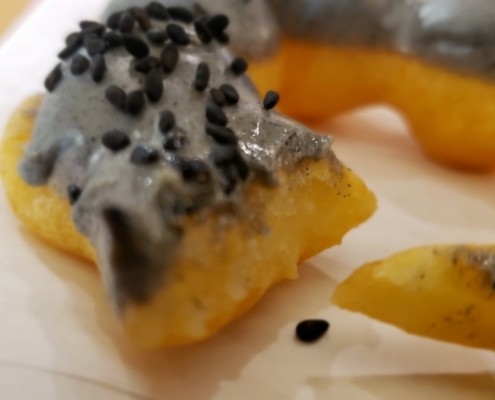 Or maybe I like the thought of black sesame because it’s so Asian and fits into my Asian ethnicity. After all, I’ve become so entranced by other Asian tastes like tea, red bean, and the like. 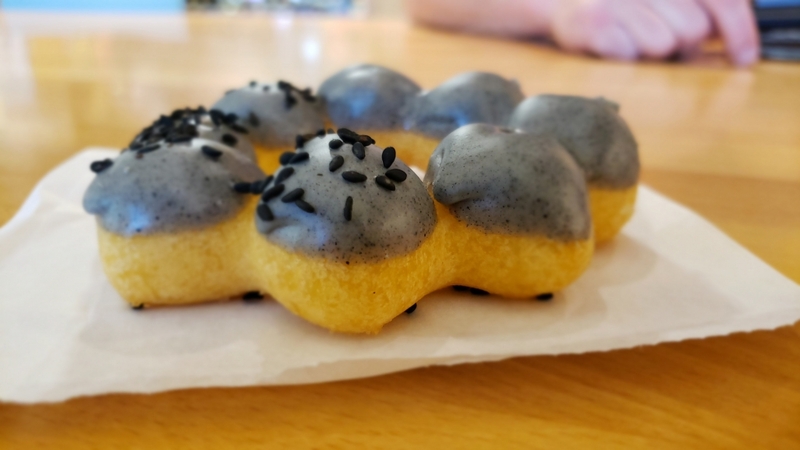 In fact, I bought a dessert for a colleague back in San Francisco when I had the donut at Vive La Tarte that had black sesame. 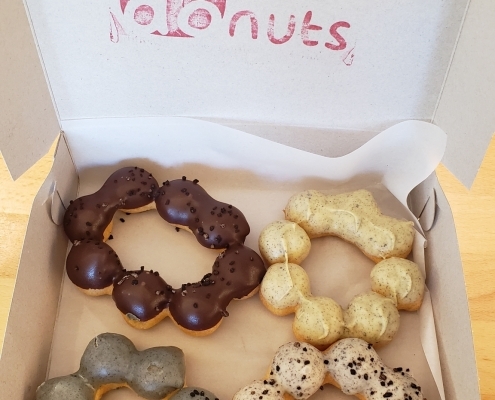 I was so interested in its foreign, uncommon flavor that I got it for a colleague as I got myself the Vanilla Filled Donut. 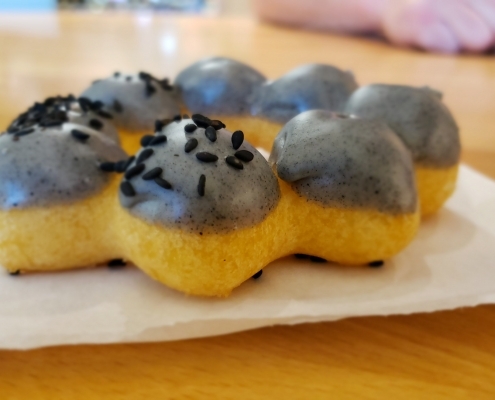 But I secretly thought about eating the black sesame pastry myself rather than giving it to my colleague. 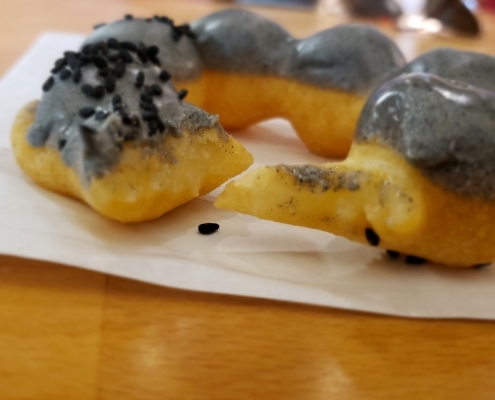 It’s a special taste the black sesame. It’s not for everyone even if its taste is subtle. 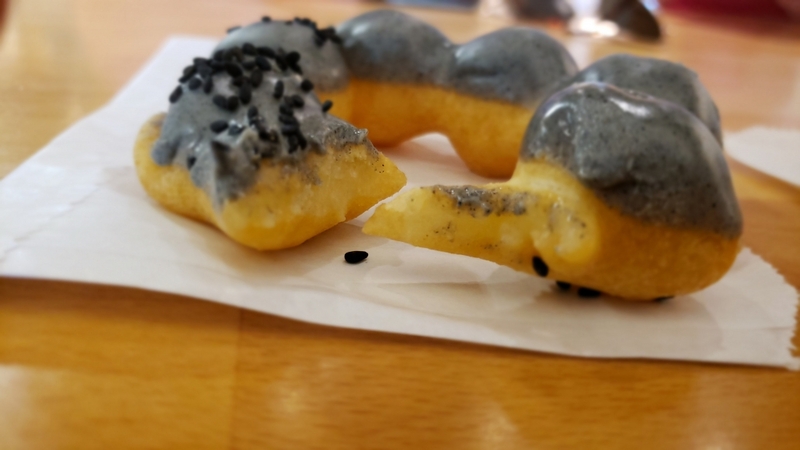 The whole donut reminded me a lot of mochi with black sesame filling that my parents would buy as dessert at home from the Chinese supermarket. 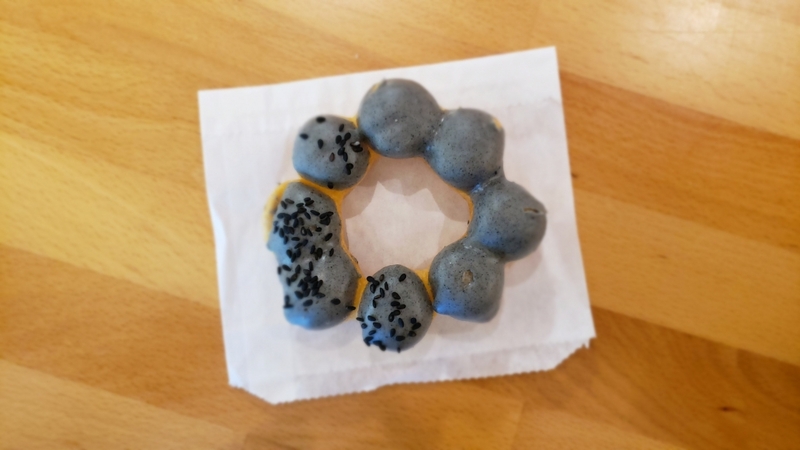 I’m not good at describing this particular flavor, but if you’re familiar with sesame, it’s a little like that. Then, sprinkle in a very fine sandy texture to the sweet frosting and this is what the donut frosting tasted like. Meanwhile, the donut is made from a mochi flour. It’s similar to rice flour. It’s nothing crazy, but adds an ever-so-slight chewy factor to the donut. It gives the consumer a satisfying “clean-bite” feeling. 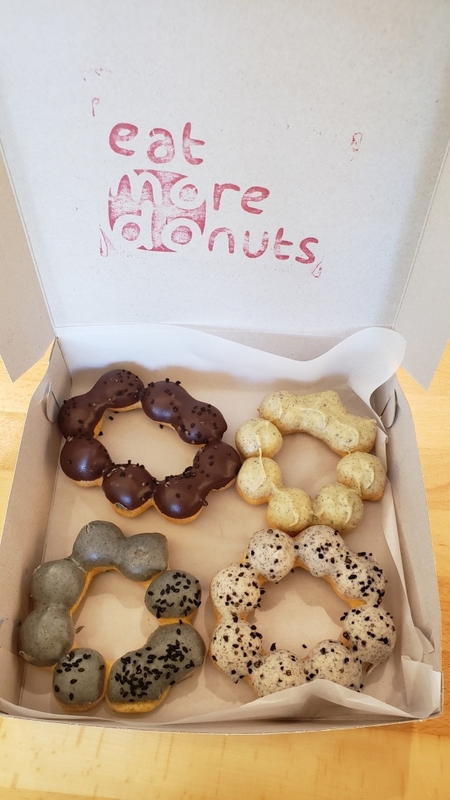 And of course, as you can see from the pictures, the donut comes in a necklace-like form of large beads. This enables the consumer to tear of these beads that are perfect bite-sizes. It’s really a joy to eat. 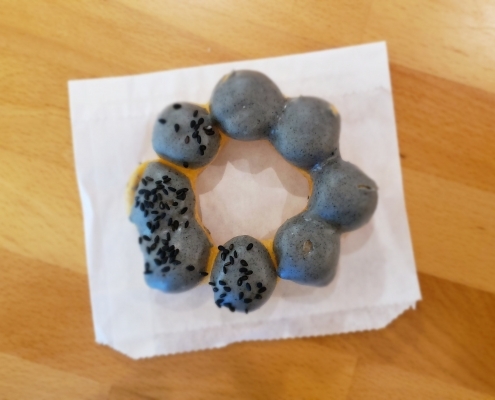 And now that my black sesame taste-interest has been satiated, I think I’m ready to try out some new foreign flavors.